This day is significant because January 26, 1961, Dr. Tomisaku Kawasaki of Japan saw his first patient with the tell-tale signs of what would later be named Kawasaki Disease (KD). Fifty years later we now know that Kawasaki Disease is the #1 cause of heart disease in children. 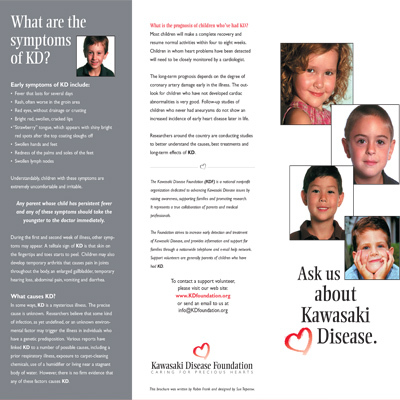 To promote awareness on National Kawasaki Disease Awareness Day, a poster depicting the tell-tale signs of the disease is distributed by KD parents at Awareness events across the nation and is available for shipment to parents and every doctor’s office and hospital emergency room upon request. 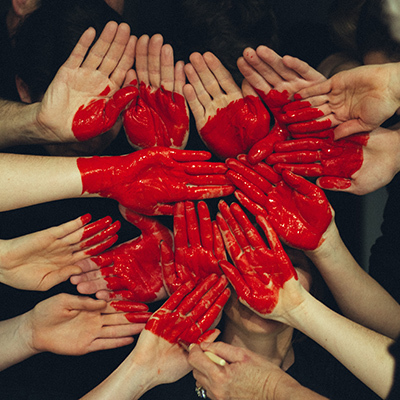 There are many ways you can help The Kawasaki Disease Foundation on this historic day in order to bring awareness to parents, medical professionals, educators, and contributors. Your tax-deductible contributions will support the Foundation’s important awareness and support initiatives. 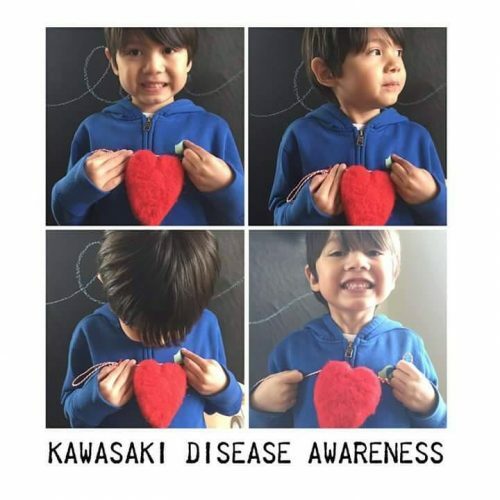 Learn how you can share the message of Kawasaki Disease and educate others about Kawasaki Disease Awareness Day. Wear Your Heart On Your Sleeve. Purchase Your KD Awareness Day Apparel Here. Get Involved and Help Spread The Message! What: Help us raise KD Awareness and funds for KD on the 26th! OPTION #2: Wear your heart on your sleeve for KD! 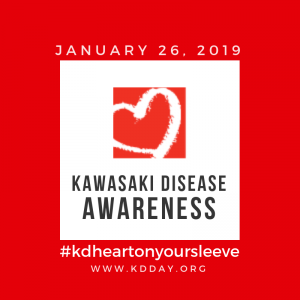 Purchase a shirt via our Heart on my sleeve page and show us how you wear your heart on your sleeve for KD by sharing your pictures wearing your shirt on our Twitter/Facebook or Instagram account using the #kdheartonyoursleeve. Help Spread The Word To Medical Professionals, Family & Friends, and Your Local Community By Downloading and Distributing These Informative Posters. 25% of Children with Kawasaki Disease who do not receive treatment in time, develop heart disease involving the coronary arteries. Sometimes the best way to help is to share! 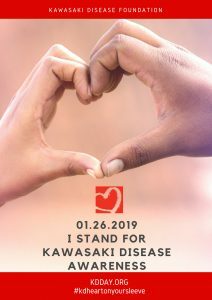 Help spread the word about Kawasaki Disease on January 26th, 2019. An independently hosted and managed KD discussion forum free of advertising and pop-up messages. The web site of a young boy in the UK who had KD in March 2005. 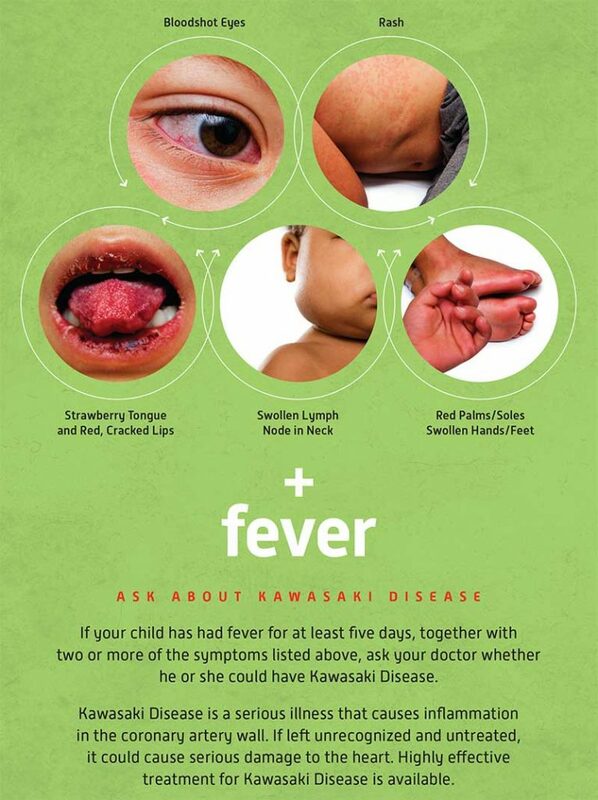 Learn More About Kawasaki Disease! I remember June 20, 2014 like it was yesterday. It was a sunny Friday afternoon, two weeks after my oldest daughter, Alina, turned 5. I had just picked up my two daughters from the Montessori school where I was notified that Alina was running a fever. On top of that, her teacher noticed a large bump on the right side of her neck. Not knowing what it could be, I immediately took Alina to urgent care, where I was told it was an infection and sent home with antibiotics. Over the next 48 hours we alternated Motrin and Tylenol to keep her fever down, but it still remained high. By Sunday afternoon our daughter was rolled up in a ball on our bed, complaining of pain all over her body. The bump on her neck, now the size of a golf ball, had not gone away and the antibiotics did not seem to be working. It was at that point we decided to take her to Lurie Children’s Hospital in Chicago. Once we arrived at the emergency room, the staff immediately checked us in. They asked us a series of questions while they monitored Alina’s condition. By the evening her condition did not improve, so they admitted her into the hospital. Once they transferred us upstairs and we had settled into her room, it was a constant flurry of doctors and nurses in and out of Alina’s room. We were not told of any potential diagnosis, so we were always fearful of what we would hear. 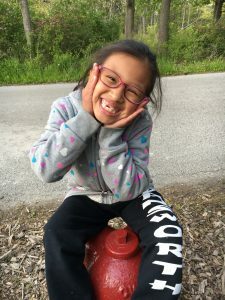 Not knowing what Alina had was eating away at us, so my husband decided to Google her symptoms and came across Kawasaki Disease. He was home with my younger daughter at the time that he did the search, but told me to ask the doctors about this possibility. After reading the articles he sent me, I thought there was no possible way my little girl had this rare disease, but a couple of days into being at the hospital I decided it wouldn’t hurt to ask. It was then that the doctors told me they were indeed observing Alina for KD, but they didn’t want to say anything too prematurely. 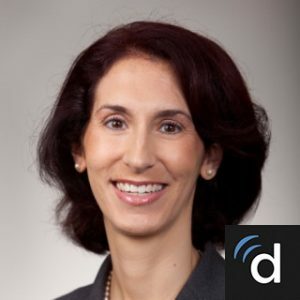 I also found out that Lurie’s has a dedicated team of KD doctors and nurses who have been studying the disease and were well familiar with the signs of KD. Since there is no test to identify KD, there are symptoms that need to be identified in order to be diagnosed with and treated for KD. By day 5 Alina had all of the symptoms: fever, rash on the hands and feet, red eyes, swollen feet, the “strawberry” tongue, and the swollen lymph node. We were told that we were lucky to have brought her in early enough to monitor and treat the symptoms in time. After the 5th day (at which point they can begin treatment), Alina was given intravenous immunoglobulin (IVIG). Almost within hours of the administration of IVIG, we could see a dramatic difference in Alina’s behavior and the symptoms begin to subside. On the 6th day Alina was finally symptom free and we were free to go home. The days and weeks following our KD experience were nerve wracking – as part of her treatment Alina was on aspirin for a short while after being discharged. We were always on edge, watching her every move to make sure she was on the right track to recovery. Alina would get tired easily and it took months for her to fully recover and get back to her old self. We had a number of follow-up visits throughout the year to check her heart and monitor progress, but thank God there was no long-term damage. We just recently passed the third year of Alina’s diagnosis. Every year around this time we take a few minutes to pause and reflect how lucky we are to have Alina healthy despite all that she went through. We are so thankful to the staff at Lurie Children’s Hospital for being so vigilant and taking such good care of Alina. We are also so fortunate to have a daughter like Alina, who through all of the poking, prodding and countless visits from doctors, residents and nurses always had a smile on her face and strength in her heart. On August 16th, 2005, my son, Connor, was finally diagnosed with Kawasaki Disease after a three week battle of constant 104.5 fevers. We were finally sent to Children’s Hospital of Wisconsin and within hours, Connor was given an echo and a diagnosis of Kawasaki Disease with multiple giant coronary aneurysms. As a receptionist in a medical clinic, I knew all about the medical terms that were thrown at us the next 11 days of our hospital stay. Every day he could have a heart attack, but through love, support, and a great doctor and nurse at Children’s, Connor is still going strong. We dealt with a leg fracture the summer before kindergarten, and in November of 2015, a brain bleed. We can never thank our family and friends enough for all love and support through the years. 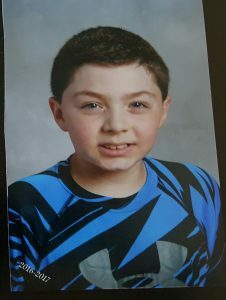 Many kids like Connor are lucky – early diagnosis and NO heart involvement, but many have heart issues and some don’t make it, but the word needs to spread on getting these kids diagnosed quickly. When my son, Cayden, was 3 months when he broke out in a rash, red eyes and peeling skin. I was but brought him to the doctor and they told me it was Hand, Foot, and Mouth Disease. I was sent home and realized it was not getting any better, and at that he was getting high fevers. I brought him to St. Louis Cardinal Glennon, where they kept us for 10 days watching him. Finally, a heart specialist came in and explained he had Kawasaki Disease. We were shocked, not ever hearing what KD was, and so he told us everything that can happen and the medicines to treat it. Cayden received his first IVIG medicine and went home after it all cleared up, and he was back to his normal self. After a week at being home, we noticed all the symptoms coming back, so we rushed him back to the hospital and they told us it had come back, so they tried IVIG again, and once again he was cleared and sent home. Another week passed, and we noticed when we laid him down on his back his arm would turn white and when we held him he was fine, so we rushed him back to the ER and they did scans and tests and told us he had Kawasaki Disease for the 3rd time, but this time they noticed he had an aneurysm in his armpit that was cutting off his circulation. After a few weeks in Cardinal Glennon, and a lot of surgeries on his arm we were sent home. 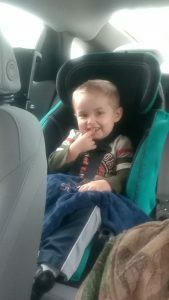 We arrived home had a very happy child, until once again for the 4th time Cayden got all the symptoms back, and at this, the doctors and nurses were all speechless not understanding how my child had this disease 4 different times. Cayden from that point has a lot of heart tests and CT scans, and we have to give him a shot every day of blood thinners because he now has 7 aneurysms that the doctors are watching very closely. 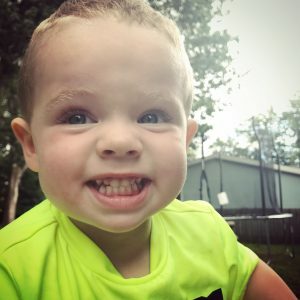 My son, Kase, was diagnosed with KD when he was only 11 months old. We live in Spencer, Iowa, which is a small town in northwest Iowa. After battling high fevers, whole body rash, reddened eyes and general lethargy, swelling of hands and feet follow by a misdiagnosis of Hand, Foot Mouth Disease, finally desquamation of hands and feet over two weeks after onset of his symptoms, along with the abnormal blood work, it led us to the diagnosis of Kawasaki Disease by the family doctor. My doctor had only seen one case of KD in his career, and our closest cardiologist is two hours away. We had to wait another week before seeing the cardiologist, which was almost three weeks after his initial onset of symptoms. His first echo showed dilation of his left coronary artery, so he was started on aspirin therapy for two months. After two months, they repeated his echo, which showed no change, so we stopped aspirin and we just had a repeat echo this past spring, and it showed very minimal dilation, and we were discharged from the cardiologist. I’m beyond grateful that his heart damage was minimal, and that today he is mostly a healthy and happy two-year-old boy! In 1979, I was a resident on the wards at The Children’s Hospital in Denver, Colorado. It was my first month as a “supervisory” resident, leading a team of interns and medical students and admitting children to the ward for care. During that month, we admitted not one, but two patients with a mysterious illness characterized by rash, fever, bloodshot eyes, and cracked, bleeding lips. Our attending and all the consultants whom we asked to help were equally puzzled. One day, the intern on the team, Dean Prina, came in holding a new article just published about Kawasaki Disease in the United States. We stopped rounds and poured over the report that perfectly described our two mystery patients. One developed coronary artery aneurysms, the other did not. We had no treatment, so we gave aspirin and waited for the fever and clinical signs to abate. I was struck that here was a new disease about which we knew virtually nothing. How KD Chose Me as a Career Path? I came to Kawasaki disease in a rather circuitous fashion. 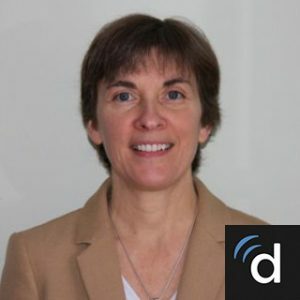 By the time that the fascinating world of KD research found me, I had completed medical school at UCLA, pediatric residency training at Cedars Sinai Medical Center in Los Angeles, and pediatric infectious disease training at the University of California, San Diego. I had even had a year of pediatric pharmacology training and was finishing up a Master in Clinical Research as I was passionate about finding the right dosing of medications in children and new treatment for infections such as HIV. What I didn’t realize was that I would find myself well-trained but searching for a puzzle to solve and that KD would be that puzzle. After much soul-searching, a senior colleague and mentor of mine said, “I know who should talk to”, and without even asking, he dialed Dr. Jane Burns’ office number. She answered and within moments she was pitching a clinical trial of Infliximab in KD patients that she had been wanting to design and launch. From a world of infectious diseases where I had chosen a career based on the certainty of picking an antibiotic therapy based on the infection we could see on a plate in the microbiology lab, I dove into a world of uncertainty with KD. An unknown cause, an increasing number of cases, a rising rate of resistance to therapy, lack of a diagnostic test, only one proven treatment…I should have questioned my decision but instead I jumped in wholeheartedly and have not looked back since. I’m blessed every day by the families I get to meet, by the team members with whom I work and by the colleagues I have met in a variety of fields around the world. As I say often, I look forward to the day when we figure out the cause(s) of KD and eradicate it. I’ll be happy to find another calling then. Until then though, I’ll be here. As a physician-in-training in pediatric infectious diseases more than 30 years ago, I was struck by the patients I saw with Kawasaki and the conversation with affected families about the condition. These families were faced with the new onset of serious illness in their previously healthy child due to a condition they had never heard of before. The physician caring for the child had to tell the family: 1) the cause of the disease was not known, 2) there was effective treatment but how it worked was unknown, and 3) their child could develop lifelong heart disease. This conversation was extremely difficult for families to hear and the physicians to tell. All of this made clear the importance of understanding the disease better. During my training, my mentor Dr. Shulman, who is very interested in Kawasaki Disease and other heart infections, encouraged me to pursue investigations into its cause and how it affects the heart. Since completing my training, I have investigated the diagnosis, etiology, pathology immunology of Kawasaki disease. The parents, grandparents, and other family members of Kawasaki disease children who fervently desire to improve awareness, education, and research have inspired me to continue this work for the past several decades. I first became involved in caring for KD patients and their families in the early 80’s, before IVIG was an established therapy. At the time, I had recently completed my fellowship training in Pediatric Cardiology and completed a masters degree in biostatistics and epidemiology at the Harvard School of Public Health. Because of this training, my department chairman, Dr. Alexander Nadas, asked me in 1982 to assume responsibility for children with KD at Boston Children’s Hospital. I had no idea at the time that this disease would become a lifelong mission for me. The 80’s were an exciting time for Kawasaki disease care and research in Boston. disease. We formed the “Kawasaki team,” with one or the other “Jane” on call at all times for any child who came into our Emergency Room with KD as a possible diagnosis. The early results with IVIG in Japan prompted the formation of the U.S. Multicenter KD Research Group and also the first international Kawasaki Disease Symposium in Hawaii in 1984. To test IVIG therapy in a US population, we were fortunate to obtain funding from the National Institutes of Health for a US multicenter trial of IVIG plus aspirin versus aspirin alone. The study conclusively showing that IVIG was a highly effective therapy for most children with KD. This study was the first of many other trials and other clinical studies on the effects of different treatments on preventing coronary aneurysms and reducing inflammation in KD. Of our many research studies, I am particularly proud to have demonstrated the utility of z scores (dimensions adjusted for a child’s size) to diagnose coronary artery enlargement. I am also proud of the 2004 American Heart Association guidelines in which we created an algorithm to improve the rate of timely IVIG treatment of patients with suspected incomplete KD. I am blessed to be working with members of an extraordinary KD Team in Boston (http://www.childrenshospital.org/conditions-and- treatments/conditions/k/kawasaki-disease/overview). At the heart of the team is Annette Baker, the nurse practitioner and program coordinator who has worked with KD patients in this position for the past 28 years. 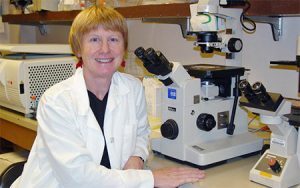 Rheumatologists on the KD team are led by Dr. Mary Beth Son, Chief of Rheumatology at Boston Children’s. Many other rheumatology and cardiology faculty contribute their expertise in diagnosis, treatment, coronary imaging, exercise testing, and bypass surgery. I have great confidence in a bright future for KD research, including studies to better understand the causes of KD, the body’s response to the disease, and better methods for treatment of coronary aneurysms. effective treatments to eliminate the development of coronary aneurysms.